Yesterday, Saturday morning that is, my family and I tumbled out of the house to see the Hermitage Museum and Gardens. My mom has been wanting to see this for...well I guess since she moved to Virginia. Anyways the Hermitage is a historical house in Norfolk that was built in 1908 by a couple from New York named William and Florence Sloane. Originally just a summer home, it was lived in by the Sloane family until the 1960s. The gardens are beautiful to see! You're probably thinking, oh, that's a nice history lesson, but why is this on your art blog? Mrs. Sloane was an avid art collector. She thought that the Hampton Roads area wasn't cultured and brought it upon herself to collect a lot of varied types of art. The Sloanes were actually one of the people who helped start the Chrysler Museum. Mrs. Sloane's collection includes many paintings (some by friends or relatives), furniture, sculpture and woodwork (on and in the house by Charles Woodson), and a surprisingly wonderful Asian art collection. Even today, the upstairs part of the house is used as an art gallery as it would have been when the Sloanes lived there. I'll go ahead and put two of the artists/art that I liked the best. First, in one of the gardens was a sweet sculpture/fountain of a young girl. 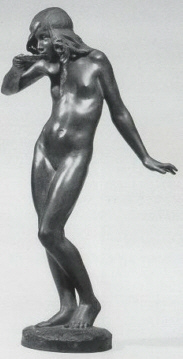 Girl Drinking from a Shell was by the artist Edward McCartan in 1915. 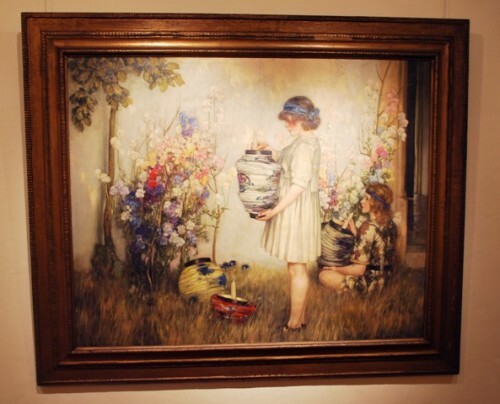 The other was in the art gallery upstairs entitled Rejoice Greatly by Stephen Reid in 1927. Then that at 6pm my mom and I went to d'Art to its 25th Anniversary Celebration. Most of the artist's areas were open for exhibition of their work. It was fun seeing local artists and their work. Though I didn't really talk to any of them since most weren't at their area and the music was loud besides. I did pick up a few business cards and one of the artists had a resume to pick up, so I did to look over to write my own. Today! I went to Micheal's and got some cheap stretched canvas and canvas panels so I'll start painting tomorrow. Yay!